Posted on December 25, 2018 by admin Posted in New Build, News	. 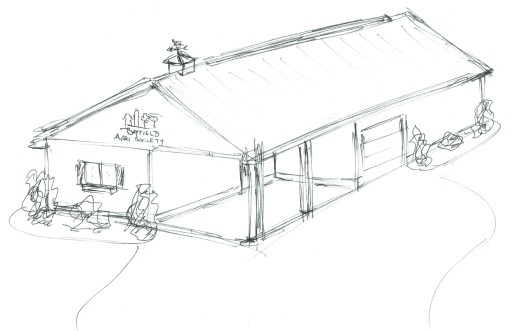 The building committee for the Bayfield Agricultural Society’s Farm Animal Display Building Project wanted to update the community on its fundraising. As of this week there is less than $10 000 to raise of the $85 000 cost for the building. Anyone wishing to support the project to replace the former Pet Display (Old MacDonald’s farm) Building can send a donation to the treasurer, Jim Erwin, Box 236, Bayfield. Doreen MacKenzie who submitted some recollections last week put pen to paper for some further stories. Chelsea Mommersteeg was the first Junior Director of the Pet Display (Petting Zoo.) She and her twin brothers, Brett and Alex, had helped with the display since it had been retrofitted. They were enthusiastic, energetic young people who attracted many other young folks as helpers in the display. Their greatest challenge came in what was fondly called, “The Great Rooster Chase.” The area inside the gate of the pet building was fenced off making a good grassy area where we put a pair of large Muskovi drakes and a pair of large geese –one white, one grey. They were to police the area and intimidate anyone who tried to come through this gate to evade the entry fee. This generally worked really well. One year we tried to improve on the gate guards by adding a Mallard drake, a large red rooster and a pair of guinea fowl. Unfortunately these reinforcements had other ideas. Some flew over the gate, -the Mallard squeezed under! They escaped into the neighbouring back yards, and then began “The Great Rooster Chase!” The helpful young lads and the twins chased after them and finally cornered the Mallard and the Red Rooster. The guinea fowl disappeared and that fall were heard in different areas of the village, and finally the river flats. The Mallard and the Red Rooster spent the rest of the fair in cages. One noon hour when most of our animals’ visitors were out hunting for hot dogs and other “fair food”, I saw a tall gentleman pick up a child and place him in the calf’s pen. Now this was against all our rules for the health and safety of both children and animals as I hurried over to explain to the man. He said that the little child was a member of the “Christian Blind Mission” choir that was touring the area and that he as one of their sponsors wanted the child to experience, with his other four senses, as much of the fair as he could. We persuaded the curious calf to come over to the gate of the stall and with the child on the outside of the gate, had him reach in and pat the silky head and damp nose. Then he had his fingers licked by the curious little calf. (One was reminded of the poem about the blind men who tried to describe an elephant.) Fortunately there was no sign that the child had stepped in anything “yuckie” and the sense of smell was not part of the situation! Further stories are encouraged and will be shared through the Society’s Facebook page. This building has made a major impression on many and many volunteers over the years have ensured fairgoers had a hands on experience with many farm animals. The new building will be a reminder of all the work those volunteers have done over the years to educate the public. The building committee would encourage those who want these experiences to continue into the future to consider making a donation toward the building. If there are questions, call Doug at 519 482 9296. Posted on December 16, 2018 by admin Posted in Uncategorized	. Planning for a replacement of the Farm Animal Display building in Agricultural Park has been a project of the Bayfield Agricultural Society for over a year and a half. This building to replace the former Pet Display (old MacDonald’s farm) Building will be identical in size with a dry storage (15×20’) attachment. This additional space will accommodate a secure office location for the days of the fair and storage the remainder of the year. The Ag Society is seeking the community’s support to assist with the funding of the $85 000 project. Since last week there is less than $20 000 to raise. This past week one non-resident donor said three generations of his family have attended the fair and he wanted to contribute. His family has appreciated the efforts the Society has made over the years to organize the fair and all the activities involved. Another donor challenged others to donate and he would match donations up to $2500. The Society is beginning to realize the generosity of the community when it has needed assistance. This past week was quite spectacular when the first Rafter sponsor approached us. If families are wanting to have their names recognized on our donor wall, this week would be good to call 482 9296 for information even if they want to make the donation at some point in 2019. Donations can be made by cheques made out to the Bayfield Agricultural Society and mailed to our treasurer, Jim Erwin, Box 236, Bayfield. In addition arrangements have been made to handle donations of stocks or bonds. All sponsor level donations will receive a charitable receipt for income tax purposes. Donations may be made to honour the memory of someone also. If further information is required, call Doug at 519 482 9296. The petting zoo building was originally the “Poultry Building” and each year it rang with crows and quacks and honking. The variety of bird species displayed were polished and groomed to a high shine and were a delight to behold. When the number of entries diminished, Mr. Pepper was contracted to bring his collection of show birds, and they too were beautiful. After Mr. Pepper retired (or died) we would put one or two animals in the building for the children to look at. Tom Penhale would bring his sister, Eleanor’s, donkeys and there might be a calf or a pig as well. When we decided to “get serious” about the “Petting Zoo”, we had Jim Koene and his crew retrofit the building. They made proper box stalls with gates in front and they redesigned the old food display cupboards with chicken wire between the sections and wire in the front doors. These had been painted white and were quite tidy looking. The cement floor could be swept clean and added to its use for small animals. We contacted people with animals; a lady who displayed llamas, a girl with rabbits, and at one time the owners of emus! At this time one of our most enthusiastic directors was Carol Rome McArthur who made sure that her son at the “Pleasant Pheasant” brought animals to the pet display. One was a beautiful three-quarter size pony who was given the stall at the window and would neigh his critical comments to the horses going by in the parade. He won people’s choice by a landslide vote!! Another was a veal calf named FREEZER that we immediately renamed “FRAZER!” A trio of goats also arrived from the “Pleasant Pheasant” to help fill the stalls. At that time we contracted for a pony ride which consisted of four ponies that were fastened to a ring and travelled round and round. At night these ponies came into the pet display building much to the ire of Eeyore, the donkey, who would stand up on his hind legs and bray. One year a mother donkey and her baby were part of the display. This baby was a complete favourite of young and old. One gentleman sat patting him all evening, and when it was time to close, his wife said, “just turn off the lights and shut the doors, -I’ll come and get him in the morning.” Then she turned and left followed by the bemused husband! The baby had another moment of fame when it was time for him to go home. The owner led the mother out of the barn and said that the baby would follow. “I don’t think so” thought the young rascal and cantered smartly toward the show ring. We all formed a circle around the little fellow and closed in. When he returned to his mother, the owner tucked him under his arm and carried him to the truck. End of argument!! The comments from Doreen do not include the fact that the large picture depicting Old MacDonald’s Farm was painted by her. Another very unique feature of the old building is the locking mechanism that Tom Penhale devised. No one could ever figure out how it worked until you were shown the first time. By next year the new building will begin the process of generating new stories.